Our range of general and special purpose one-off cleaning services is the most efficient and affordable way to deal with all those house cleaning chores that require special attention and professional approach. When it comes to end of tenancy cleaning, we understand how important it is to get it right the first time as customers’ rental deposits are at stake and the last thing they need before moving out is more landlord woes. Take the guess work out of cleaning and let us deal with the situation in the most efficient and professional manner and with the least amount of hassles and costs. The web server used by Cleanersnodland.co.uk is located in Great Britain and run by Dedicated Server Hosting. This web server runs 2 other websites, their language is mostly english. 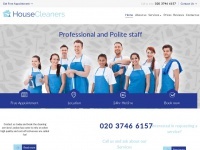 A Nginx server hosts the websites of Cleanersnodland.co.uk. For managing the data of the webpages the CMS WordPress is used. The website uses the latest markup standard HTML 5. The website does not specify details about the inclusion of its content in search engines. For this reason the content will be included by search engines.